The brown marmorated stink bug (Halyomorpha halys), a winged invader from Asia that is eating crops and infesting U.S. homes, is spreading and is expected to continue to do so. Adult (top) and fifth-instar nymph (bottom). No one is sure exactly when it got here, but the brown marmorated stink bug may be coming to an orchard, field, or attic near you. Halyomorpha halys, a native of Asia, has been expanding its range since its U.S. discovery in Allentown, Pennsylvania, 8 years ago. It has since been detected in portions of Virginia, West Virginia, New Jersey, Delaware, and Oregon, has infested houses in Maryland, and is showing up in increasing numbers in ARS traps in Beltsville, Maryland. Jeffrey Aldrich, an entomologist and expert on stink bugs at the ARS Invasive Insect Biocontrol and Behavior Laboratory in Beltsville, is developing a weapon that will use the insect’s own body chemistry: a pheromone-based trap. Stink bugs are a relentless threat to cotton, corn, soybeans, and other crops. “They’re mobile and not particularly susceptible to insecticides,” Aldrich says. The impact of H. halys remains to be seen, but ARS researchers in Kearneysville, West Virginia, have seen them feeding in apple orchards, and in Asia, the bugs feed on ornamental plants, weeds, soybeans, apples, peaches, figs, mulberries, citrus fruits, and persimmons. The biggest problem in the United States so far has been in homes. When the weather turns cool each fall, the bugs look for wintering sites and make their way into houses and buildings. They don’t harm humans, but if they’re squashed or pulled into a vacuum cleaner, they emit an unpleasant odor. Aldrich was stunned at the degree of infestation he saw at a private home near Hagerstown, Maryland, last year, particularly in the attic. The homeowner was looking for a simple way to get rid of them—and there is none. Entomologist Jeffrey Aldrich prepares to use a confocal microscope to locate and identify the area from which the brown marmorated stink bug produces pheromone. 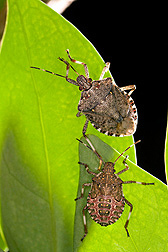 Adult male stink bugs often produce attractant pheromones. In Japan, the brown-winged green bug, Plautia stali, a cousin of the new arrival, releases a pheromone consisting of a single compound that is the basis for a lure used in a Japanese commercial trap. Aldrich has been working with Ashot Khrimian, an ARS chemist, who has synthesized the compound in the Japanese trap. Aldrich put the compound in experimental traps he designed to monitor H. halys, and he says the population has jumped from barely detectable levels in 2004 to numbers that now surpass those of the native green stink bug. “It’s early in this insect’s invasion and things are still unfolding, but it is spreading and it’s going to continue to spread,” Aldrich says. He is searching for a H. halys pheromone that can be synthesized and used in a trap to protect houses, fields, and orchards. Using the bug’s own pheromones would likely make for a more effective trap than using pheromones from another stink bug. Aldrich is raising the bugs in his lab, inserting them into specially vented tubes, and using gas chromatography to look for pheromones among their emissions. He initially tested clusters of stink bugs, but studies show that some stink bugs emit more pheromone when raised individually, so he is now running his tests on individual H. halys. He’s optimistic the results will pay off. “I find it hard to believe this thing doesn’t have a pheromone,” he says.—By Dennis O’Brien, Agricultural Research Service Information Staff. The research is part of Crop Protection and Quarantine, an ARS national program (#304) described on the World Wide Web at www.nps.ars.usda.gov. Jeffrey Aldrich and Ashot Khrimian are with the USDA-ARS Invasive Insect Biocontrol and Behavior Laboratory, 10300 Baltimore Ave., Beltsville, MD 20705; phone (301) 504-8531, fax (301) 504-6580. 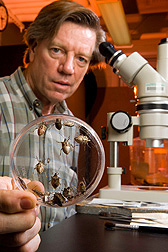 "Combating the Brown Marmorated Stink Bug: A New Threat for Agriculture, a Nuisance for Homeowners" was published in the July 2009 issue of Agricultural Research magazine.